"In the great, green room, there was a telephone, and a red balloon..."
One of my earliest memories is sitting snuggled on my mother's lap listening to the rhythm of her voice reading this story to me. 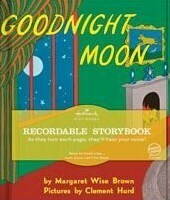 Then, the first gift I bought for Curly Miss when I found out we were expecting was a copy of Goodnight Moon so I could read it to her. Now, we're expecting our fourth child. I'll have to admit we've gone through several copies of Goodnight Moon; our house is not kind to books that are well-loved, as much as I have tried to instill that value. Many families take a picture album of their family to share with their adoptive child when they first visit them. The wait between court and the homecoming can be long for families and children alike. We adoptive families want our children to begin bonding with us, an impossible task when we're separated by two continents and an ocean. As many of you already know, Abi is blind. Not totally; she can see a wee bit, like a brightly colored book held close. But pictures of our family probably wouldn't mean much to her. I have wracked my brain for a way to bring a bit of our family to her when we go to court. The, the other day I saw a commercial for Hallmark's new product: a book that lets you record the story being read. The commercial showed a beloved grandpa reading to his young grandson before leaving for his home far away. It struck me in that moment that a child far away, a child who cannot see the pictures of our family, could listen to her new mommy's voice reading a special book to her. A book that my mommy read to me, snuggled safely in her arms. I've read this book hundreds of times. I'm not sure I can get through this reading of it without tears. That's awesome! We love that book in our house, too! Wow, how incredible. It's one of our favorites too. What a wonderful memory for her, that she will be able to pass on to her kiddos someday too. How sweet! I know I wouldn't be able to get through it without crying, so good luck! I have to admit, we do not have that book. It was recommended by many, but we just didn't have money to spend on books. We only could go to the library, and my parents didn't read me that one. I know that much. My mom read to me a lot, but not that one.